This year, we once again spent a few weeks cycling around New Zealand, but this time we went to the South Island. It seemed like it was ages before we actually did any cycling though (apart from riding from the airport to the YHA when we flew into Christchurch; into the most horrendous headwind by the way). The day after we arrived we spent in Christchurch, as intended, and we visited the museum and Antarctic center, which were both very interesting. I accidentally had my camera on the “wrong” settings after doing some night time shots, but it turned out to be quite a nice effect. Captured the motion of the train very well. Our cycling trip was to begin on the West coast, and we planned to make our way south, so we had booked ourselves onto the TranzAlpine, which is a scenic train that travels between Christchurch and Greymouth on the West coast. 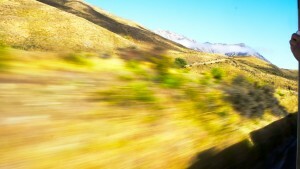 It is quite a long train journey (compared to what I’m used to at least); getting into Greymouth in the mid afternoon. The views were spectacular, though, particularly between Christchurch and Arthurs Pass where the railway runs along valleys between high mountains. They had a commentary as well, with interesting information about the construction of the railway. At Arthurs Pass station, the train stopped for a few minutes, mainly to attach more locomotives as a contingency in case they needed to come back out of the 9 km long tunnel, but also so that all of us could get off to stretch our legs. This turned out to be rather eventful as well, because a bloke from our carriage didn’t get back on the train in time. It was very lucky that his wife saw him on the platform and the conductor just happened to be right near where she was sitting when she yelled out “that’s Frank over there on the platform.” The conductor radioed the driver to stop the train, and Frank got back on. To a round of applause. 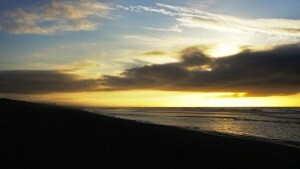 Once we got to Greymouth, we had about half a day. We had been planning to stay that night in Greymouth, and presumably spend the afternoon exploring the area, but as it turned out, Greymouth didn’t seem to be a particularly attractive town. Traffic and people everywhere. 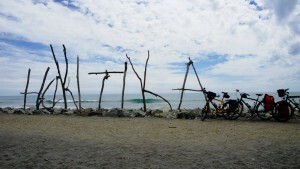 So we decided to ride down the road to a smaller town called Hokitika. At this point I should mention a bit of geography. In the south island, the weather tends to come in off the Tasman sea, which results in lots of rain on the western side of the alps, and a relatively dry climate to the east. Knowing this, I had come prepared with rain jacket, over pants and waterproof shoe covers (no really, they make a difference as we found out later on in the trip) expecting that we would have rain 24/7 the whole way down the west coast. The locals apparently refer to it as “the wet coast”, and we saw in a few places a poem about incessant rain. Anyway, we got off the train at Greymouth and it was warm and sunny, and stayed that way for almost the whole trip down the coast. All of my wet weather gear was squashed down the bottom of one of my front panniers. After we left Greymouth, it was only a short distance (about 40 km) to Hokitika, but we were starting quite late, at 2 in the afternoon, so it wasn’t that short really. We did do part of the West Coast Wilderness trail, which was nice; unsealed track through dense forest, but it ended up taking 10 km to join back up with the road 3 km further down from where we turned off. On the way to Hokitika, a lady at an antique shop told us that it was very busy, and a lot of camp grounds were full. We phoned up the place we were thinking of, and sure enough, they were full. In the end, we got ourselves a patch of grass to put our tents on at a place a few kms before the town itself; quite a nice spot. Our first rest day was after just one (partial) day of cycling. Hokitika is actually a very interesting place; we spent our time at the local museum, and also a knitting shop with the most fascinating collection of knitting machines. I spent quite a lengthy period of time looking at one, but I still could not get my head around exactly how it works….. *goes to Wikipedia* I think I’ve figured out how they work. 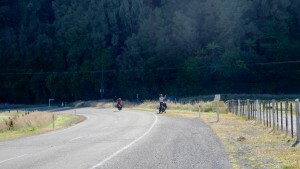 After we left Hokitika, we rode along another section of the wilderness trail. It started with a board walk, which was unsettlingly narrow, with no railings, just a meter or so drop off into the quagmire below. I decided to walk that section, I could easily visualise the outcome of a slight wobble to either side while riding. We soon reached solid ground though, and the track from there went up towards a lake, also through dense rain forest. The track was a bit rough, enough to make my bob trailer bounce and thump around (but then, that’s not saying much, they are notorious for that sort of thing). Interestingly, it did not feel to be significantly more hard work compared to carrying panniers, so I suspect that the additional drag or energy losses associated with a trailer are actually quite low. The beasts themselves are only tiny little things, and they don’t hurt or anything; instead their bites itch incessantly for the next week. As we were heading further south, the sandflies also started to get serious. For those who are not acquainted with them, they are tiny little insects that bite you. They don’t hurt, but the bite itches like mad for a week afterwards, driving you nuts. It also kind of bothers me that the reason they bite you is to get your blood so that they can go away and make 10,000 sandfly babies, and for this reason I try not to let any of them survive if they bite me. They also get into your tent when you go to bed, but that is easier to deal with: I developed a practice of zipping up my tent and then methodically killing every single sandfly that had joined me with hopes of starting a family, one at a time. 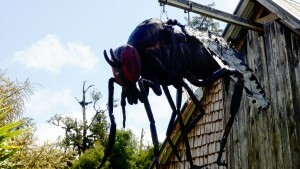 It wasn’t hard, they tend to buzz around near the walls of the tent like trapped flies and you can squash them easily. I made sure that I went to the toilet before going to bed though, because I really didn’t want to open the tent again and let any more sandflies in after I had established my little decontaminated zone. Anyway, as we got near to Hari Hari, we went in to the Wanganui river, where there were apparently volcanic hot pools. Well, we traipsed through the bush accompanied by 500,000,000 sandflies but could not find any sign of any hot pools. I had a dip in a shallow creek (I didn’t dare go into the raging torrent that was the Wanganui river) but I kept it brief, because the sandflies swooped on my exposed skin. New year’s eve in Hari Hari was pretty sedate really. We had dinner at the pub, and they had a band playing, but the noise did not disturb us at all from the motel where we stayed. In Australia if we want to go to bed early on new year’s eve, we celebrate “New Zealand new year” at 10 o’clock at night, but we realised, as we were going to bed at 10 o’clock at night, that that wouldn’t work in New Zealand. I suggested that we could celebrate Hawaiian new year, at 10 o’clock the following night, but no one else was very enthusiastic about doing that. We had wonderful views over the alps after we left Hari Hari. Many non cyclists who we have spoken to have implied that the south island is incredibly hilly, and basically said that we will return to Australia with legs like tree trunks. Well, at this stage it seemed like they were lying, because it had been flat all the way from Greymouth (well, you know, flat with a few lumps in it, but it is a far cry from the reports of humongous, steep climbs all over the place). After Hari Hari at least, we had a bit of a hill, where the road went over a low ridge between two river valleys, called Mount Hercules. Despite the dramatic name though, it wasn’t particularly difficult; steep enough for second gear to begin with sure, but only a couple of kilometers long. It did not climb to a very high altitude. Having said that, there were huge steep mountains all over the place, but it seemed as if they were so steep that the civil engineers had no choice but to put the road on the flat land, which suited us fine. 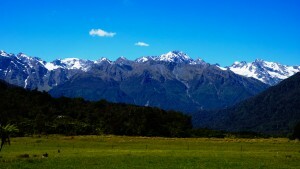 Here in Australia we don’t get snow capped mountains like the southern alps in New Zealand. At Hari Hari, I noticed a sore throat coming on, and as we got nearer to Franz Josef, it was developing quite nicely into a full on flu. Oh well, as illnesses go I can live with the flu, just feeling increasingly lousy as the day progressed.